Walter Torre Junior – owner of WTorre – is a man who believes in what he does. His enthusiasm is unmistakeable. Professionalism apart, one can see – not least by his constant interaction with Palmeiras supporters via social media – that he takes great pride in making history – together with Palmeiras – through the constructing of what will stand as the most modern multipurpose arena in Latin America. Walter could relax and just build the arena; after all, the plant is detailed and budgeted, the schedule is set. But no, Walter keeps pushing the limits, always open for new ideas and improvements. As a result, he decided to incorporate the “stehplatz” concept – an idea brought to him by a group of supporters – into the project. And now, WTorre presents the latest modifications to the project: an ultramodern reflexive metal casing that will wrap the entire exterior of the New Arena, making it visually similar to other high-end stadiums (think Allianz Arena in Munich), including the ability to change/reflect colours projected from the inside. The illustrations below (“green arena” version courtesy of PDT) give an idea of what Walter is preparing for Palmeiras (and this without causing delays to the original schedule, mind you). Thank God for people like Walter Torre Junior, standing their ground and doing their jobs in the midst of Mustafás, Giltos and Olivérios. 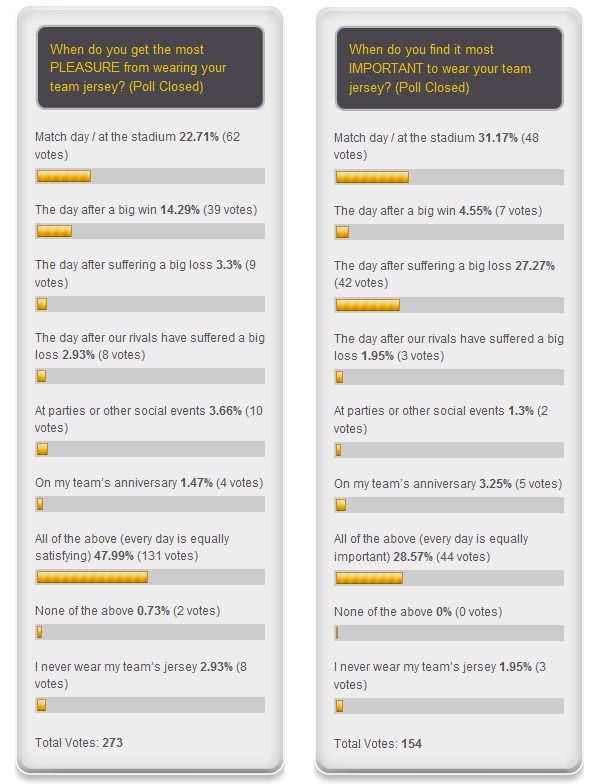 Our first two polls at Anything Palmeiras are now closed; click the thumbnail to your right to check out the results in detail. In total, 427 votes were computed. Surprisingly, the number of votes in the first poll was almost double to those in the second. Perhaps the subtle difference in the questions made people insecure. Anyway: you readers clearly get pleasure and also find it important to wear your jersey at just about any occasion. In addition, you find it important to wear it on match days/at the stadium and also after suffering a big loss. I sympathise in particular with that last result. Today (Thursday) against Coritiba, Kleber enters the pitch for the 100th time wearing the Palmeiras jersey. Anything Palmeiras wishes our Gladiator the best of luck and many goals today and for each day that he continues honouring our colours! Don’t be alarmed by the sudden lack of posts in the next week or so: I’m off to the nortwestern parts of the Amazon on a work-related field trip. As a means of compensation, rest assured I’ll do my outmost to bring something interesting back with me for you guys. Tchau! Have a safe trip. The new stadium looks great. I still have a terrible taste in my mouth from that match with Corinthians. Thanks, Rafa! Now sitting in a hotel room in Manaus, properly dressed in my jersey, getting ready for the game. Tomorrow early, off to São Gabriel da Cachoeira.